When it was announced that Scotland would play Italy in Malta, the members of the Sunshine Appeal had the difficult task of trying to arrange a donation to an Italian charity when we would not be visiting the country…we needn’t have worried! Very quickly it was agreed that our chosen charity would be AccoglieRete. Based in Syracuse in Sicily (the closest to Malta we could find! ), AccoglieRete is an association that promotes the role of legal guardians for unaccompanied foreign minors arriving by sea on the coast of Sicily. More than 1,500 unaccompanied foreign minors – aged 11 to 17 have been assisted by AccoglieRete in the last 3 years. Several children are now hosted by ltalian families, in solidarity communities and in sports clubs/football teams. Reunification with family members was also facilitated for many minors. AccoglieRete’s approach is based on the role of legal guardian as a fundamental element of the mechanism of support and care for unaccompanied minors, within the migration context. 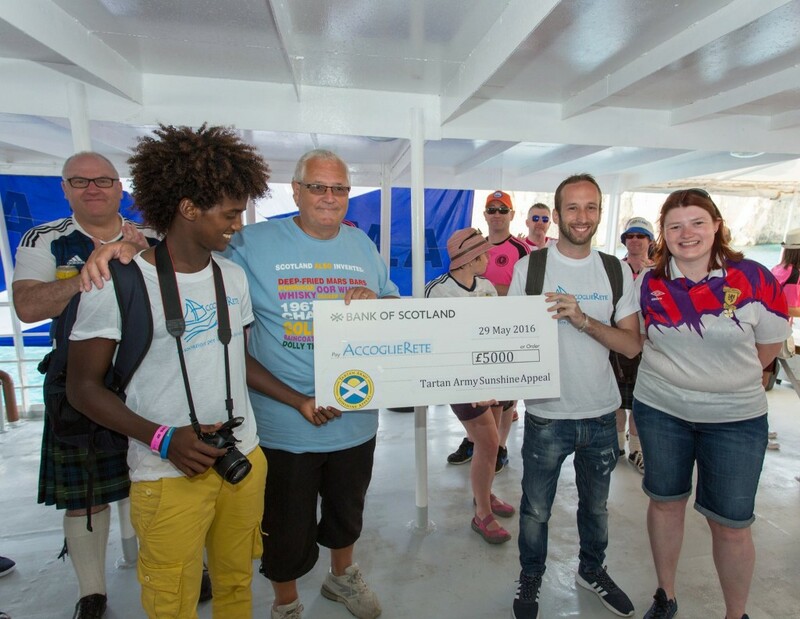 One such guardian, Damiano, chose to travel to Malta to meet the Scottish fans and accept the £5000 donation on behalf of AccoglieRete. Accompanying him would be Abdilahi (Abdi), a 17 year old young man from Somalia that had benefited from the work of the charity. In order to show them some Scottish hospitality, Loony Alba kindly invited the two men onto their boat trip before the match as special guests. During this trip both men spoke to various members of the Tartan Army, sharing stories of their lives and the people that AccoglieRete have helped. The presentation of the cheque followed, briefly disturbed by the appearance of a streaker, causing a few red faces and one speechless Sunshine Appeal Chairman! Thanks to the Italian FA, both Damiano and Abdi were given tickets for the match, which Abdi, being a keen footballer himself, described as a ‘dream come true’. 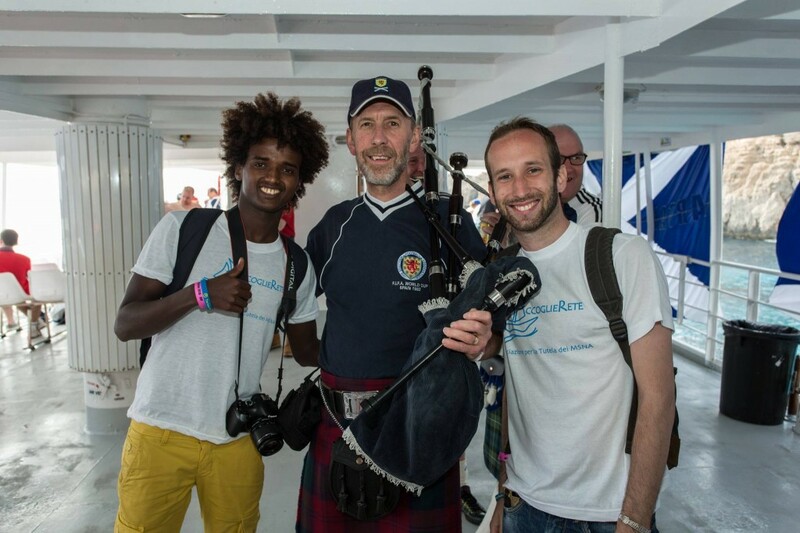 Damiano and Abdi were both delighted at the kindness of the Scottish support and were both eager to tell everyone back in Syracuse about their experience. 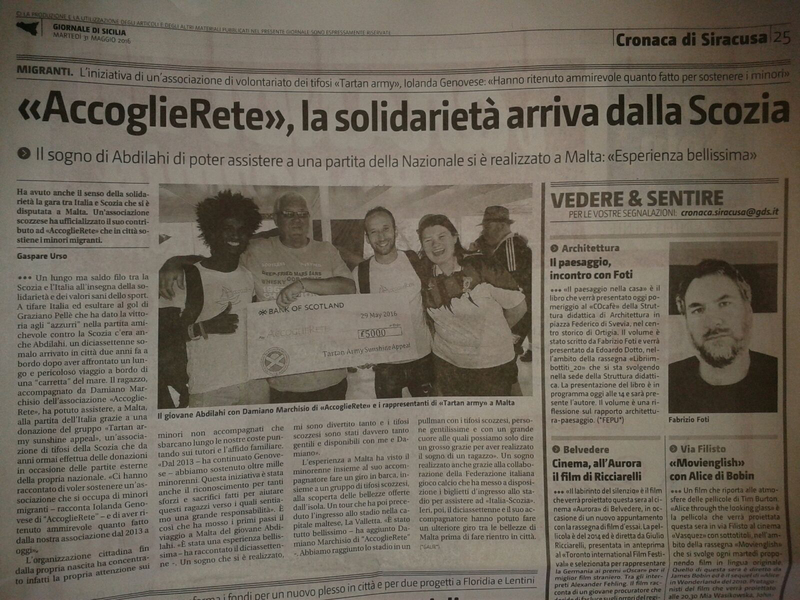 After returning home, Damiano sent his thanks in the form of a letter, (which can be seen attached), along with an Italian newspaper report on the donation and more information on AccoglieRete. The Sunshine Appeal would sincerely like to thank Graeme McGinty for producing a fantastic match programme with the proceeds going to the Sunshine Appeal, and to Loony Alba, for the donation of £1400 from the boat trip.